Feminist art explorations during the early 1970s years of Second Wave Feminism aimed to reclaim daily acts of women’s lives; as with the women's labor movements of the early 1900s, these forms of gathering often included dinners, birthday parties and other social gatherings. Lacy used this form in many performances, from the large scale to intimate and improvisational; her work in particular preshadows today’s use of food in social practices of all kinds. Lacy's dinner performances are characterized by a combination of ritual, food, and real politics. 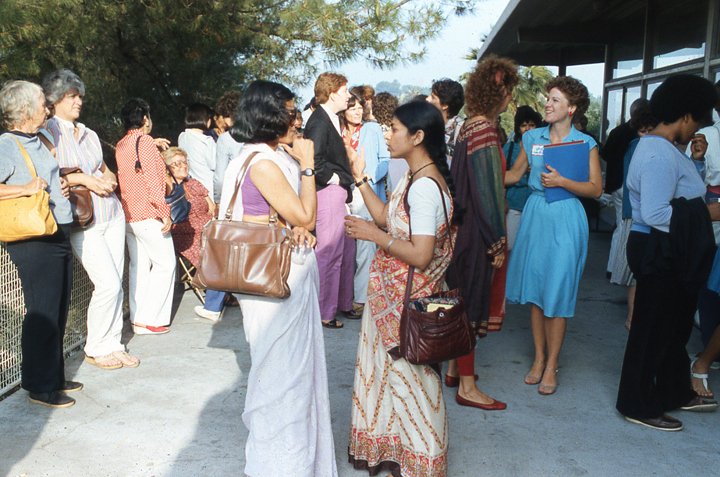 For Immigrants and Survivors, 150 women, including elderly activists, recent immigrants from Japan, India, and Mexico, Native Americans, youth from group homes, disabled women, friends of the first woman in space, and several residents of Guy Miller Homes in Watts (Lacy's previous collaborators) gathered to frame and nurture the notion of a women’s community across different cultures. Staged in the middle of yet another phase in U.S. anti-immigration sentiment, the artwork drew on parallels between those excluded from society because of various forms of prejudice. Each guest brought a dish representing her ethnic heritage or country of origin. As they ate, they wrote messages and recipes on tablecloths. After dinner, the performance continued with women sharing stories of survival on an open microphone provoking tears, laughter, and an experience of commonality. It must be remembered that at this time general comfort in cross-cultural settings was much rarer than today, and Lacy was an early Second Wave feminist to adopt a strong position on the relationship between ethnicity, race, class and gender oppression.